The Long Tail is dead. The Long Tail is a theory penned by Wired editor Chris Anderson which states that the rise in digital markets, and the slow demise of brick and mortar shops, particularly in media and entertainment, will translate into more spending and viewing of smaller niche markets. I will definitely try to purchase her book to look at her evidence in more detail, but right away, I have some problems with her interpretation of the Long Tail. Anderson never claimed that blockbusters would disappear, or that they would be less prominent. The whole point of the Long Tail is that more purchases would go to items that would not even be stocked in a brick and mortar shop, and this was a good thing. The entire premise here is that we will see an increase in more vibrant niche markets. I also have an issue with regards to her interpretation of the data. The iTunes example cited above is a good example of the Long Tail in action, which seems to bear my initial suspicion that Elberse might be trying to attack a strawman. 7.5 million songs selling sound like quite a lot of small sales, and it would be good to contrast it with the blockbuster sales. But the real problem that I have with the little shown in this article is that it selects skewed datasets, or simply seems to ignore what is really going on. Elberse is still using the metrics of the pre-Internet age by choosing to focus on iTunes sales. Anyone who knows anything about the music industry nowadays will tell you that all the action is on streaming, be it YouTube, Spotify, and Last.fm. Anecdotal evidence from Spotify users will tell you that they are using it to find music that would be impossible to find under other models; Spotify does show that the Long Tail works as intended. Moreover, we have now 10 years of evidence of waht people are actually listening to in the shape of Last.fm Scrobbler data, which seems skewed towards Indie music (probably because of the user base), but gives an indication that the story is very different to the very small sample used by Elberse. Here, niche interests are doing quite well as well against mainstream. In fact, you could claim that only 4 channels are mainstream at all, and I’m including the channel that helps to highlight other channels. Concluding, it is very early to dismiss Elberse’s arguments completely, but if the above feature some of her best examples against the Long Tail, I don’t think Chris Anderson will be too bothered. Is she rejecting the 80/20 rule too? I imagine the data exists for the most prominent platforms and the answer is known — I just don’t know it at this second. -In CPG, the long-tail is killing giants now. 90% of top 100 CPG brands lost market share to nice upstarts. The long-tail is indeed crushing it, did people even say that in 2013?!? Be well, thanks for the posts! Thanks for the message. I always loved the long tail, and it’s good to see that it lives on (I thought Elberse got it wrong). I also have to thank you because you are replying to Greg, a good friend who passed away last year from cancer, and it is nice to find his words online from time to time, makes me remember him fondly. 20 % of the tunes on spotify were never played once. How is that compatible with long tail ? @guest the Long Tail never has claimed that everything will be played once, just that more things will get more play. 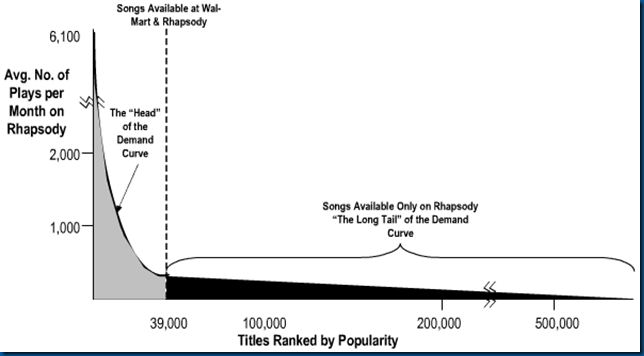 It all depends on which dataset you read, Last.fm shows something more akin to the Long Tail.